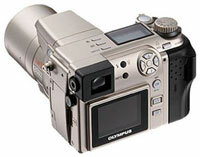 Olympus announced the new C-2100 Ultra ZOOM, an image stabilized digital camera with a 10 times OPTICAL zoom. Finally, Olympus joins the elite group of manufacturers building a camera with true optical zoom in excess of the standard 3:1 zoom. In my opinion, this is one of the key features of the most popular digital camera, the Sony Mavica, which boasts a optical zoom of 14:1 in some models. Without changing lenses, a photographer has the equivalent of a 38 to 380mm lens (35mm equivalent), in the palm of their hand. The C-2100 Ultra ZOOM features both an electronic and optical viewfinder and can take pictures as fast as three frames per second in burst mode. In standard mode, it can take a picture every 1.2 seconds. Shutter speed ranges from 16 seconds to 1/750 and the f 2.8 lens can be stopped down as low as f 11. The included Digital ESP multi-patterned metering system is quite advanced and features center weighted, spot and multi-spot metering of up to 8 spot readings. Exposure modes range from fully automatic to fully manual, including the usual aperture and shutter preferred modes. Olympus includes the new S-Program mode which adds special settings for Portrait, Landscape, Sports and Night Scenes. Custom setup modes are also available for even greater control. Exposure compensation is in third step increments, in a four step range (+/- 2 steps EV). This camera is also capable of auto bracketing in 1/3, 2/3 or 1 stop increments for either 3 or 5 shots. Wow! File storage format is uncompressed TIFF, low compression JPEG or normal compression JPEG. Combining these formats with 3 different image dimensions ranging from 1600x1200 to 640x480, yields 12 different storage settings. The 10X image stabilized zoom, combined with the high quality Olympus lenses and imaging system, will make the C-2100 a sensational camera. 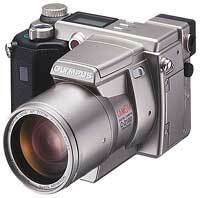 Available in August for under $999, the Olympus C-2100 could become a top sales leader.